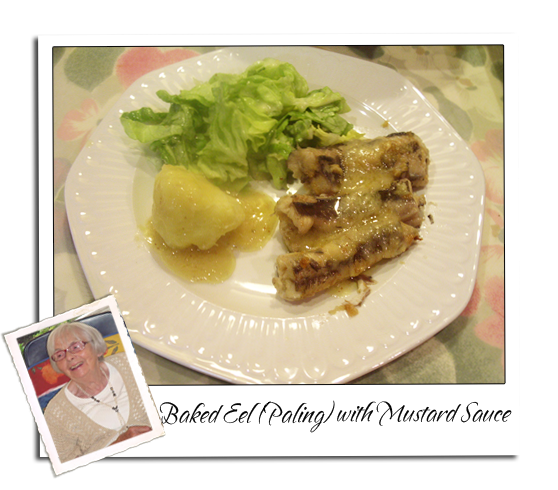 This is one of my favorite food that my mother prepared for us, and she made it again when I went home. European eel is a ‘catadromous’ fish – that is, it spawns and is born at sea, and then migrates into inland waters to eat and grow. In the course of its life, it travels many thousands of miles, and passes through a number of very different stages, marked by changes in their colour. European eel is now believed to spawn in the Sargasso Sea in the middle of the North Atlantic, whence the larvae then migrate to the coasts of Europe by drifting on the Gulf Stream. There they congregate in estuaries as glass eel, before metamorphosing into elvers and moving upstream. They spend most of their lifespan (6 to 20 years) in freshwater, where their bellies turn yellow. When the time comes for them to spawn, their skin turns silver and their stomachs dissolve. They then return downriver to swim back to the Sargasso Sea where their lives began. European eels can live for over 80 years and reach up to 130cm in length, but average length of adults is around 60-80 cm, when they weigh around 1-2 kg. The main fisheries for eel take place while they are migrating, when they are trapped and netted in estuaries and inshore waters. While traditional fisheries for local consumption tended to focus on adult eels, the last fifteen years have seen the emergence of a fishery for glass eels, which are exported to Asian markets where they are fattened in farms before being sold. 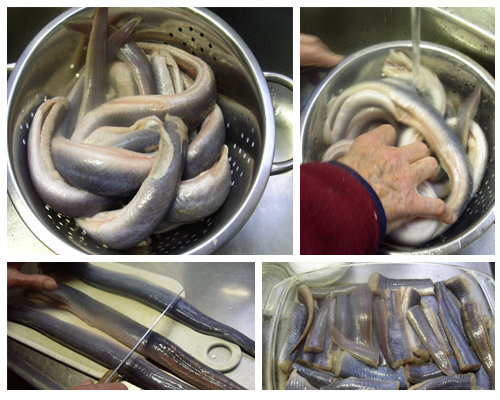 As a result, the price of glass eel soared, to the point where in the mid-2000s it exceeded that of caviar. Turn the oven on to 350F/180C. Wash the eel. Cut in 3 pieces. 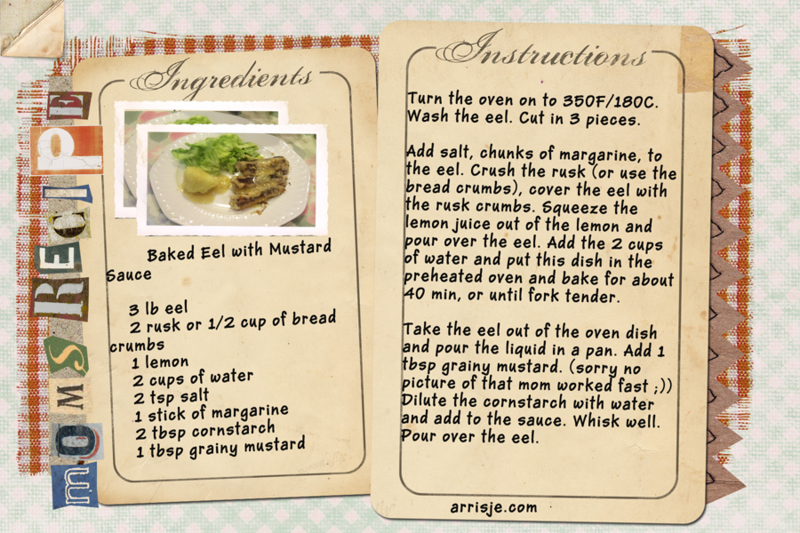 Add salt, chunks of margarine, to the eel. 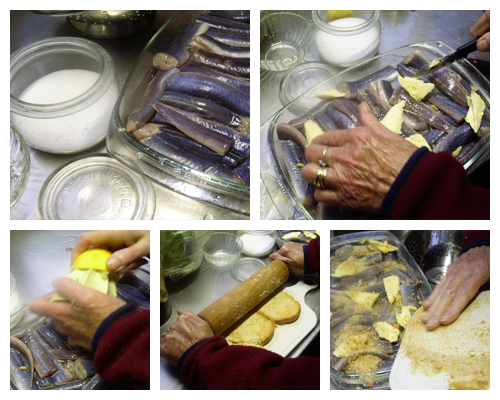 Crush the rusk (or use the bread crumbs), cover the eel with the rusk crumbs. Squeeze the lemon juice out of the lemon and pour over the eel. Add the 2 cups of water and put this dish in the preheated oven and bake for about 40 min, or until fork tender. 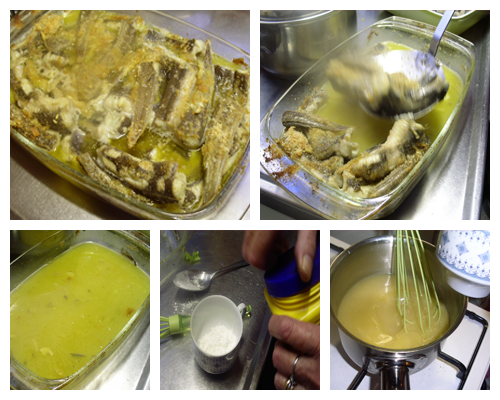 Take the eel out of the oven dish and pour the liquid in a pan. Add 1 tbsp grainy mustard. (sorry no picture of that mom worked fast ;)) Dilute the cornstarch with water and add to the sauce. Whisk well. Pour over the eel. Ewwww 🙂 Ewwww. I am not going to try this one but it is nice to see new recipes. It has been a while. I see your Mom’s hands. Did she make this for you when you went home this last time.